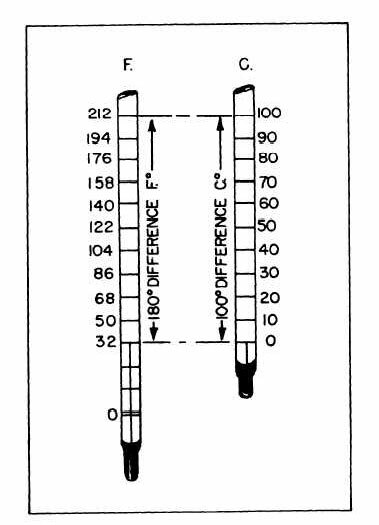 Home > Medical Manuals > Intro Nursing Manual > Figure 8-2.Temperature Comparison. The boiling point of water is 100°C and 212°F. The difference between the boiling point and the freezing point of water is 100° and 180°F. See figure 8-2. Therefore, within this span on the thermometers, 1°C equals 1.8°F. However, temperature readings on either scale are taken in respect to the number of degrees below or above zero, thus 320 must be added to the 180°F in order to obtain the total reading from the Fahrenheit zero point. Substituting these values into the conversion formula (°C x 1.8) + 32, we have (100° x 1.8) + 32° = 212°F. If we wish to convert Fahrenheit degrees to centigrade degrees, the algebraic order of calculation must be reversed and we find that (°F  32°, ÷ 1.8 = °C. Substituting the values we find (212°  32°) ÷ 1.8 = 100°C. EBULLITIONThis is probably the most common process involving heat. The term merely means boiling, to wit, raising the temperature of a liquid to the point where it changes to vapor or steam. All liquids have a definite temperature at which this occurs, a factor called the boiling point and the basis for separation from other liquids by distillation. Boiling is used extensively in compounding, since in most cases the volubility of the preparation is increased. As an example, consider making instant coffee with cold water compared to using hot water.